Keeping track of your income and expenses will help you when it comes to paying bills, saving money, and having the ability to do extra things. If you don’t know where your money is going you may not be able to do what you need with your money. When you keep track of your income and expenses you’ll have the ability to make changes so you can purchase something you may not otherwise be able to do. When you keep track of your income and expenses you’ll have the ability to make changes so you can purchase something you may not otherwise be able to do. If you have no idea where your money is going you won’t be able to control things, eliminate things, and you won’t be able to do the extra things you desire. Vacations won’t happen and you’ll struggle and stress if your vehicle breaks down or your basement floods. If you’ve tried to manage your budget in your head you may have found it didn’t work too well. That’s because you can’t remember how you spent every penny and more than likely you can’t remember how much every bill is you owe. With our very busy lives, it’s nearly impossible to remember everything, so it’s not worth it to mess something up by trying to remember everything. With our very busy lives, it’s nearly impossible to remember everything, so it’s not worth it to mess something up by trying to remember everything. 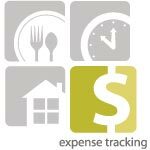 There are two techniques you can consider when you’re trying to track your income and expenses. You know organized families exist: They’re the ones who show up to soccer practice on time, the ones who always remember the teacher’s birthday, file their taxes early and still have time to host nightly family dinners. What’s their secret? It’s simple. They’ve got their schedule in order. And, it doesn’t take a village. Created with you in mind, Mead Organizher offers organizing products that help you take control of the various areas of your life and place them under one command center. Scheduling, meal planning and expense tracking options are now interconnected, helping you meet your family’s daily challenges. With a system like this, you can’t help but get organized. The Organizer Expense Tracker is an undated reusable planner that allows you to keep track of what’s coming in and going out in one bungee-corded 8.5 x 11 inch binder. There are worksheets for tracking expenses and cash flow, 12 monthly pockets for receipts and bills, and Tech Lock rings that secure punched items. The covers are made out of durable poly, and, additional downloadable sheets are available. There’s also a current and future year monthly reference page. Using a pencil and paper is one way to track everything. You’ll have access to it whenever and you won’t have to worry about losing it if the power goes out or your computer were to crash. It’ll be easy to make changes as well. 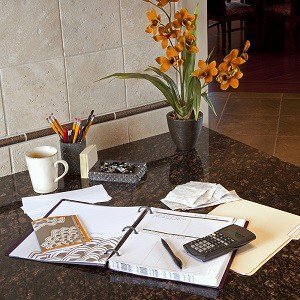 You can use regular paper or you can purchase paper specifically designed for keeping track of your income and expenses. They also have paper books that are for this task as well, like the featured product, . Using a computer program is very efficient and worth the time it takes to add the income and expenses to the program. It may take time to create and work each time, but it will be worth it when you avoid mistakes. You’ll have the ability to create charts to help you put your income and expenses into categories which will help you know where you can make changes. For example, if you spend a lot of money on eating out, you can put this in as a category and you’ll know how much you’re spending so you can make changes. When you consider both of these options and you figure out which one will work for you you’ll see the stress go away and you won’t have to worry about your income and expenses. You’ll have them under control and you’ll know where every penny goes. You’ll have the ability to make changes when you need to and you’ll know at all times where your income and expenses sit. This will help you control every aspect of Keeping track of your income and expenses without the stress of trying to remember it by heart. You’ll eliminate errors and you’ll find the changes you’ll be able to make will be priceless. Keep a log (even for a week). See how things add up. Designate a day and time each week/month to knock your bills out all at once. Don’t sweat it. Sometimes things come up. Plan. Get a clear picture of what you have to spend (and what you don’t). Set a goal. It’s easier to save when you have a prize in sight.